You must make bookings at least 5 minutes in advance of the time at Scoff & Banter - Canary Wharf. 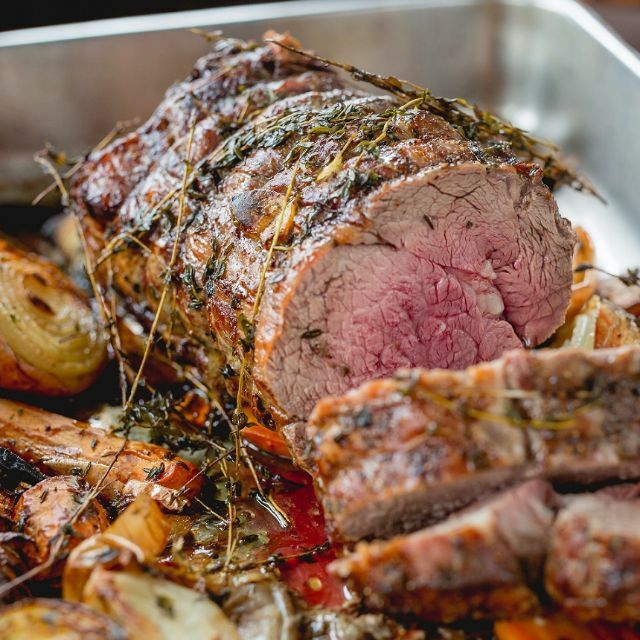 At Scoff & Banter, we celebrate hearty and traditional British cuisine, with a contemporary twist. 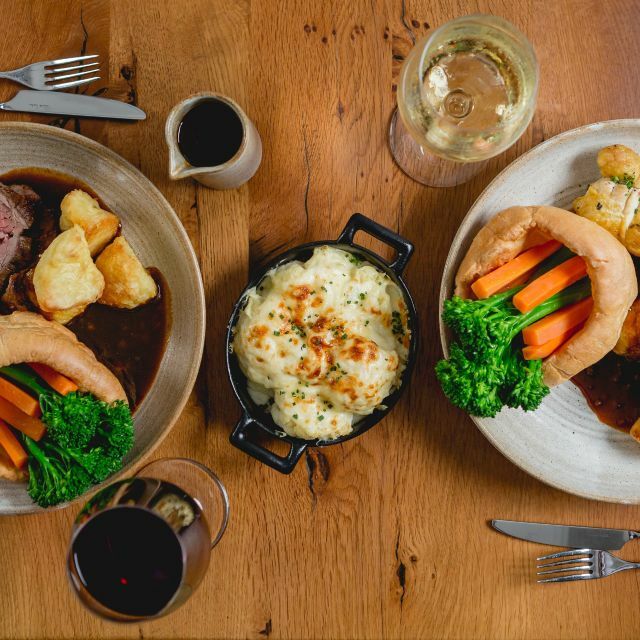 Lovingly prepared with locally sourced ingredients, discover a home from home with seasonal British cooking and generous helpings. 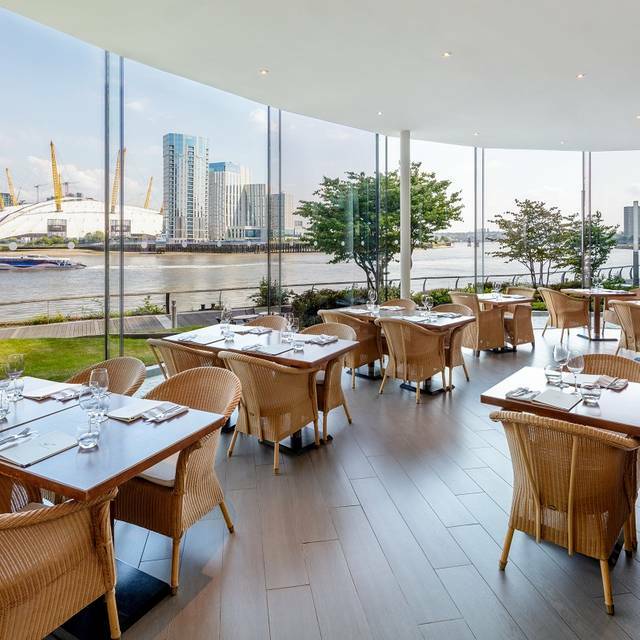 Scoff & Banter Canary Wharf restaurant is a cool and intimate space that’s all about the river. Inside, the buzzing basalt and steel bar leads through to the restaurant’s floor-to-ceiling views of the river and the surrounding área. At night our restaurant and terrace becomes a sophisticated entertainment destination to enjoy elegant riverside dining, a full sized American pool table, live entertainment, and a drinks list as enviable as our location, the terrace really is a stunning evening destination. 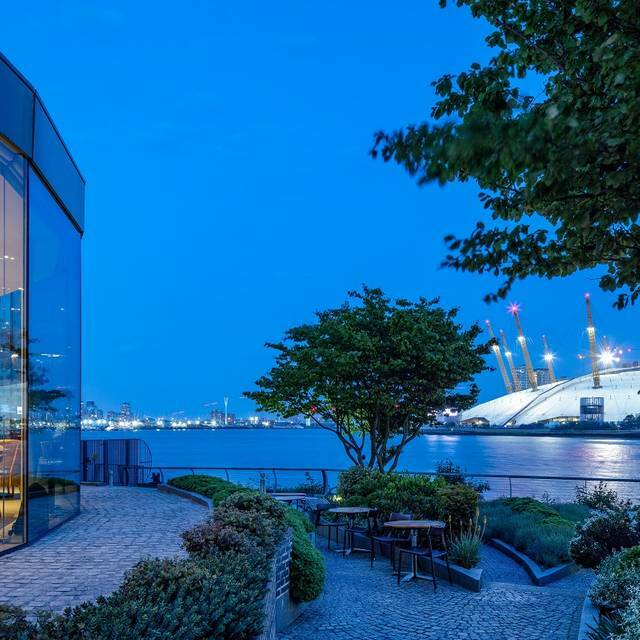 This restaurant is right opposite the O2 Arena so you can dine in style before hopping over to the stadium. 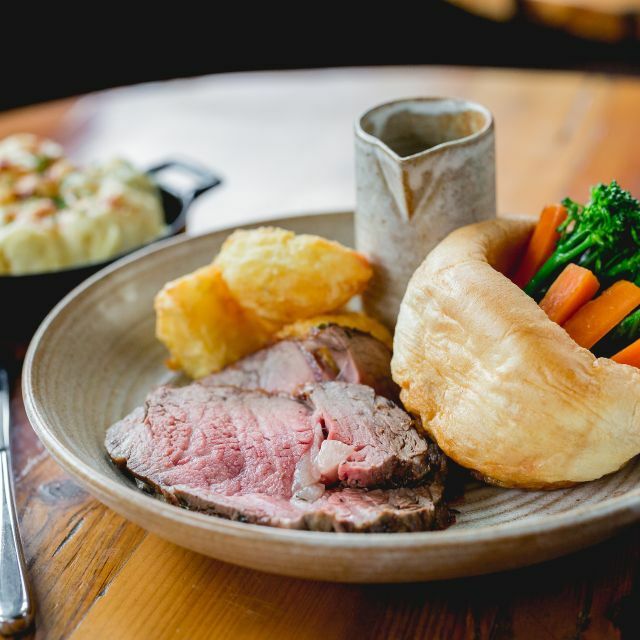 The Sunday roast has long been an English tradition. 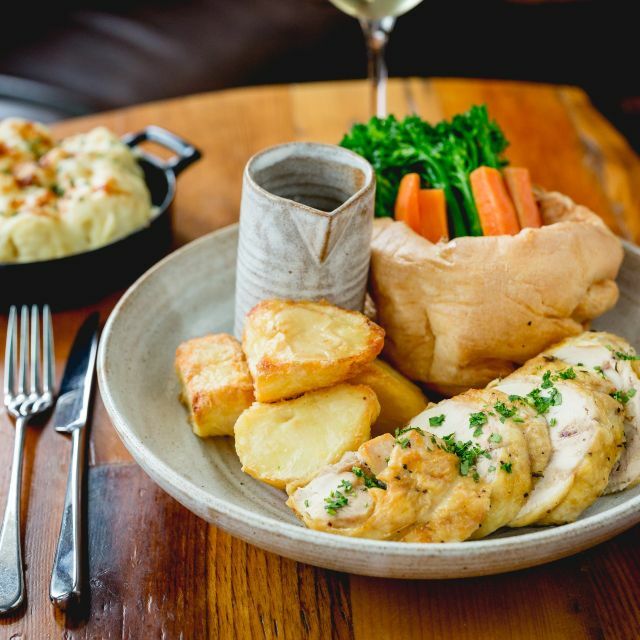 Scoff and Banter celebrating this much-loved pastime with perfectly roasted 28-day-aged beef or corn-fed chicken, accompanied with a Yorkshire pudding, duck fat roast potatoes, buttered carrots & greens, cauliflower cheese and served with a rich bone marrow and onion gravy. With a selection of delicious starters to begin and classic desserts to finish, relive childhood memories with lovingly prepared British cooking. Terms and Conditions: Maximum of 20 diners. Includes VAT, excludes service. Experience an Easter Afternoon Tea, served with a limited-edition handcrafted chocolate nest. Terms and Conditions: Maximum of 20 diners. Includes Tax, excludes service. Scoff & Banter will be hosting a live jazz performance at their Canary Wharf restaurant on Easter Sunday 21st April, with the folk-fusion duo, Lost Revellers. Drawing on gypsy jazz, tango, Celtic and Eastern-European folk music, the Lost Revellers play a mix of original compositions and creative arrangements, much to the delight of audiences far and wide. The perfect accompaniment to lunch with a view over the River Thames, sit back and listen and enjoy. Choose 2 or 3 course from a hearty British set menu. Terms and Conditions: Maximum of 6 diners. Includes VAT, excludes service. Very good food and great cocktails with service to match will definitely be returning. We had the most wonderful meal on Sunday evening for my fiancé’s birthday. Thank you to all of the staff for the exceptional service! The food was without fault; we had the set menu so I was worried the portions would be small but they weren’t! They even made cocktails for us that weren’t on the menu. We will be back! Having asked for a different table to the one we were shown to as it was directly opposite the door way, our starters set the tone as they were excellent - the salmon and the mini Yorkshire pudding. Our main courses were adequate and the chips were good. The dessert redeemed the meal with the apple crumble being the right level of sharpness, good crumble and clotted cream. Wine is a little expensive for the quantity, but we'd go again. Food great...location great ..service great.. Probably the worst service I have ever experienced in a restaurant anywhere in the world. A very slow initial drinks service, the starter arrived quickly, but main took an age and we cancelled desert just before it arrived as it took so long (circa 30 minutes). We had one pre-dinner drink, ordered wine for the meal, which never came, so we ordered it again when the main course came (we did not see any staff prior to that). The wine eventually turned up 2/3rds plus of the way through the meal so we sent it away as it was way too late. The Watercress and Spinach Soup had so much garlic in it that it was inedible. The crab cakes were very nice as was the Fillet steak main course and the Herb Crusted Lamb, but the peas that accompanied it were cold and the steamed garlic kale and tenderstem broccoli side we ordered never arrived at all. Overall a very disappointing experience that I hope is never repeated. Overall service was fabulous and staff were exceptional good. Great food, outstanding service. Located right on the water, which was nice. We could not ititially get a table riverside, so sat elsewhere, but when one opened up, it was offered to us. The servers were very attentive, and they did not seem to be in a hurry to have us leave. Overall an excellent experience. We Went for Sunday lunch but they told us that they had stopped serving it. It didn’t say online that it stopped at a specific time. Also, they brought over our drinks and then told us the above, so we couldn’t really go elsewhere at that point. Another annoying factor was that they offer all the veg, roast potatoes and Yorkshire puddings as a side dish, so we felt they could of made it for us. Went to celebrate partner's birthday - we don't normally go for the ''British'' cuisine. However I am pleased to say that I'm happy we did! Food was delicious, we had the crab cakes to start followed by the fish pie and mushroom and kale wellington. We normally don't go for dessert however we decided to give it a go based on the service we received from prior courses. Will definitely be back again for the food and the view! I took my boyfriend for his birthday meal, and we had such a lovely evening. It was early (5pm) and we had the restaurant almost entirely to ourselves, with a window seat overlooking the river. 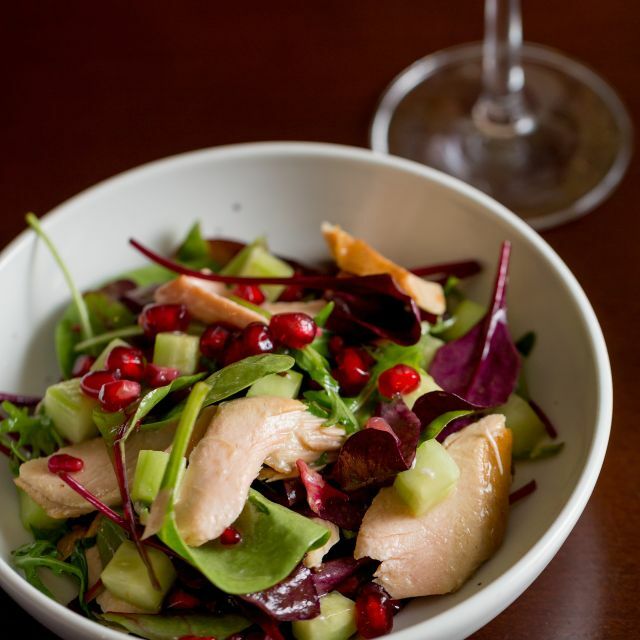 The food was great, the wine was lovely, and the staff were attentive without being overbearing. Overall, a great place for a special occasion. Hidden spot with amazing river views and great waiting staff - had been there twice in the last 3 weeks and both were exceptional. Staff were so natural and kind and attentive. And so was the food and cocktails - outstanding and very good price for the standard of food, service and views!! Thank you!! We went here for new years eve meal at it was wonderful! Seat by the window with a beautiful view, food was delicious, staff very friendly and nice atmosphere. Not too quiet and not too full! Would love to go back for a special occasion. The eton mess is heavenly!! The only small complaint would be my partners cheese board for dessert. It was very small and only one type of cracker! Everything else was perfect, thanks for making our new years eve a great one! Good service and view. But the food is quite normal. 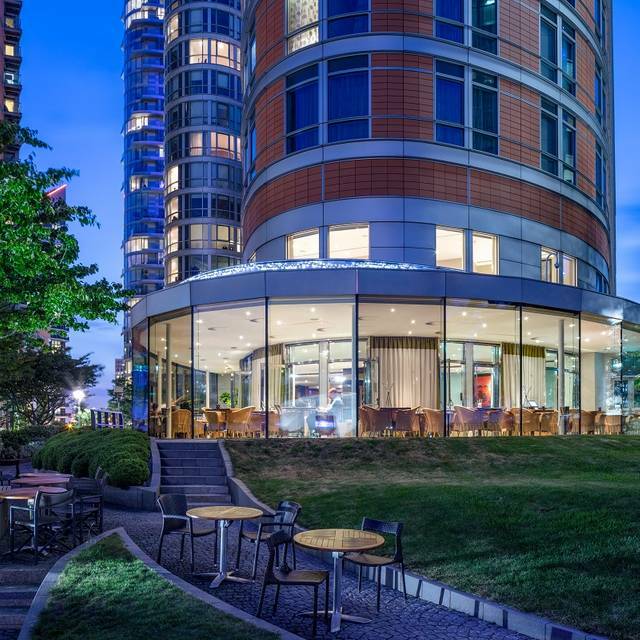 Great location and view, amazing service, great food and decently priced. Absolutely amazing experience. Had Christmas dinner as we stayed over 24th-26th . For the price of the 4 course meal (£75.00)pp, there was no complimentary water or free glass of house wine which you would thought would be offered being located in a 4star hotel. Nice welcome and help with car parking...were in lovely and staff helpful. Food was poor.....which was a shame....as spent a lot for Xmas day....main course lamb undercooked and traditional Xmas main had dry turkey and siffy roast potatoes....served in a bowl !!!!! A first visit proved to be a highly positive and enjoyable experience. Excellent food which was presented to a high quality standard. Excellent view over the Thames. We will be back. Good food. Excellent service. Ww had a quality time. Highly recommend this place. A great view from the restaurant. A reasonably priced and varied menu, with the option of set price menu offered in unison to Al la carte. Service was friendly and attentive, without being intrusive. The house wine as also offered alongside the drinks list. The food was lovely and great value for money. We would be happy to recommend the use of the restaurant to others. A very disappointing meal. The ambiance was awful and this definitely feels like a hotel restaurant. The food was not great and the steak was overcooked. This is dressed up to be a restaurant but really is nothing more than a food hall bolted onto a hotel. Celebrated a birthday here last week. Considering it was Friday night, it was very quiet and relaxed. The view is unbeatable and a lovely restaurant for a treat/special occasion. Food was ok, the steak was good and the service was great! Poor service, we waited 20 minutes for drinks and hour and 50 mins for our food. It’s was very overpriced for what we received. Staff more interested in there phones when meal arrived I had to go and find someone to get condiments and souses ! The roast beef looked good but I think the potatoes were cooked the week earlier. Stayed in the Raddison as attending Barry Manilow concert. Food was excellent and service. Would highly recommend to anyone looking for accommodation and good restaurant. Ideal spot for easy access to transport to 02 arena. Thanks for a great experience. The food was wonderful! The children’s menu was perfect for my offspring. The service was a little slow and not very attentive but overall I would recommend this restaurant again. We may attend next time for a date night as the atmosphere was quiet. At times I found myself asking my children to be quiet as you could hear a pin drop due to the restaurant mainly being silent. I happened to be stayingin the hotel and too tired to go further afield. I usually epxect to be ripped off, but to be fairm the quality was good - I just had fish and chips - and reasonable prices. Wine a tad expensive, but standard for London hotels. 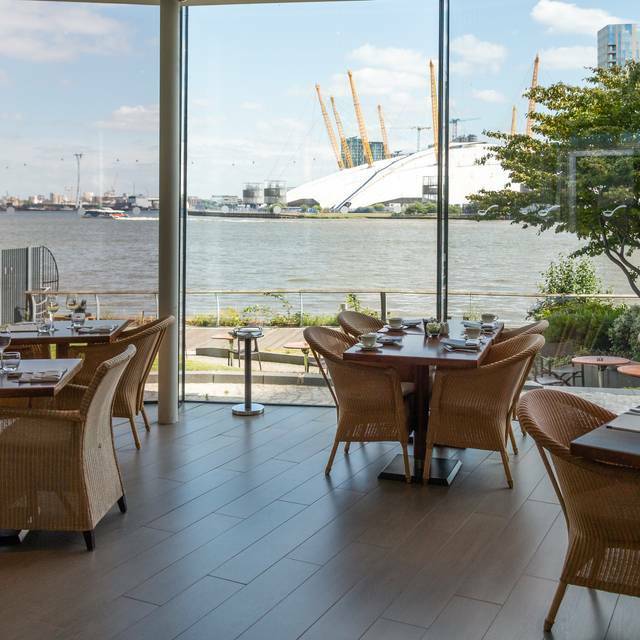 The view is great - across the Thames to the O"
I was blown away by the staff from the door to the table staff. Enjoyed our Saturday meal with my brother! Food was excellent. Thank you for making Saturday evening special! I will definitely recommend this restaurant to my friends. It was very good, the service was top notch and the food was very good. The food was fine, but the service was not good - very slow although there were many empty tables. Although we attended the booking, they reported to OpenTable that we didn’t attend it, just after finishing dinner. We emailed them, but there was no reply and no apology. Very disgusting and rude.